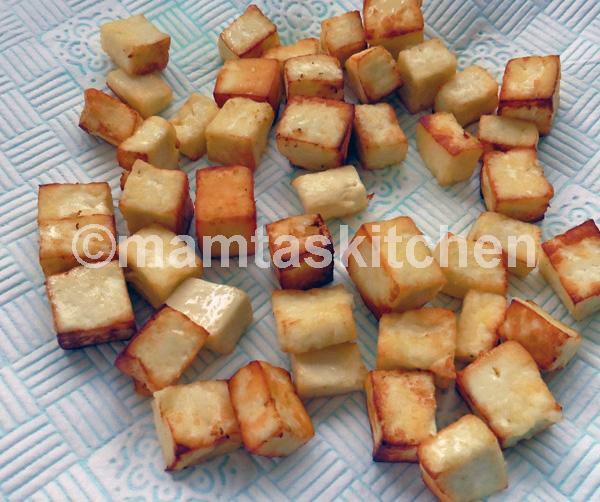 Mamta's Kitchen » Paneer Cheese, How to Make it? Paneer Cheese, How to Make it? Paneer, also known as Chena, is a freshly made cheese that is used in Indian cooking in various forms. It can be added to curries, rice dishes like pilau/pilaf/pulao and biryany, made into sweets like Rasgulla, savoury snacks like Paneer Pakora, added to stuffing for vegetables and grilled with a Tandoori coating. Search for 'paneer' for many other recipes. Paneer is a good source of protein for vegetarians. In UK, India and some parts of USA, you can buy ready made paneer in blocks from some Indian grocers. However, it is quite easy to make at home. 2L will make approximately 225 gm. of Making Paneer. Paneer freezes well, as long as it has been pressed hard before. Otherwise, the water in it can make it crumple when you defrost. Another way of freezing is to cut it into bite sized cubes, deep fry them quickly in quite hot oil so it turns brown but remain soft inside. Cool the cubes and then freeze them. 2 litre milk. Best milk for making cheese is full fat, 'blue top' in UK. Skimmed milk makes a little firmer cheese. 1-3 tbsp. lemon juice/vinegar. Bottled juice will do. Mature yoghurt or 1/2 tsp. citric acid in a little water can also be used to curdle the milk. Curdling milk on a stove: Boil milk in a heavy bottomed pan. Keep stirring from time to time to make sure that it does not "catch" at the bottom, otherwise it will have a terrible, burnt smell. If it catches, taste it before proceeding any further. If it tastes burnt, you have to discard the milk and start all over again with fresh milk*. Therefore, it is important that you use a heavy bottom pan and keep stirring frequently and not allow it to 'catch'. Once the milk is boiling, turn the heat off and add lemon juice/vinegar, 1 tablespoon at a time, stirring each spoon in very gently, until milk curdles into lumps and the whey looks almost transparent. Let it stand for a few minutes for the paneer to separate properly. Curdling milk in a microwave oven: Place 1 litre of milk in a microwave boiler. Close lid and cook on high for 6-7 minutes. Ensure that milk has come to a boil. If not, microwave cook it for 2 minutes more. 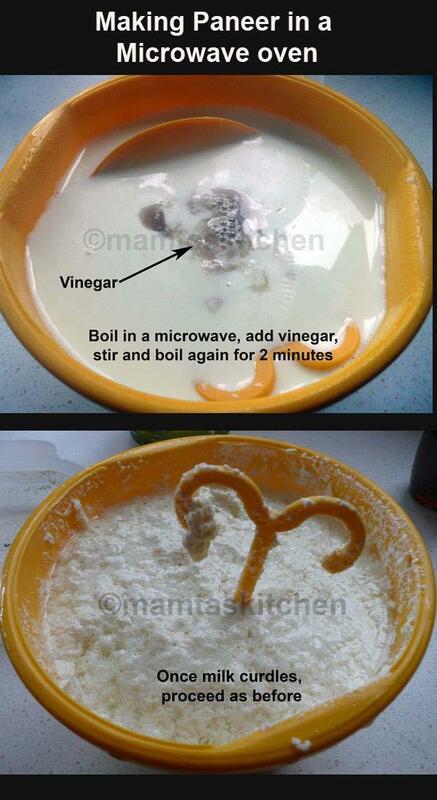 Take out of the microwave oven and add 1-2-3 tbsp. vinegar, stirring very gently. It should begin to curdle a little bit. Close lid and microwave on full again for 1-2 minutes. Once paneer and whey separate properly, proceed as below. Take the pan off the stove/microwave oven and allow to stand for a couple of minutes. Place a muslin cloth or a large handkerchief over a colander or a large sieve and pour the curdled milk onto it. Let the water drain away (some people like to save and use this water, which is whey, in cooking). Lift the muslin by holding all the corners together and tie a knot at the top of the cheese, just above it. Shape it into a ball by patting it gently all over. Place on a flat draining board or in a clean sink and press with a weight. The pan you just used for boiling the milk, filled with water, will do very well as a weight. Leave for 1 to 2 hours. If you are using it in a recipe where you do not need cubes, you don't have to press it, hanging it is enough. I often hang it from my kitchen tap. Pressed cheese is easier to cut into cubes. Take it out of the muslin. The block can be sliced, cut into squares or any other shape you want. Paneer can be mashed, if the recipe requires it. To freeze the cubes , it is worth spreading them out on a plate/tray and freezing them for an hour or two, before putting them in a bag. This will stop them from getting stuck together and it will be easier to get only a handful out, when you need it. Alternatively, you can deep fry the cubes, cool them and then freeze them in a bag, as shown in the first photo.